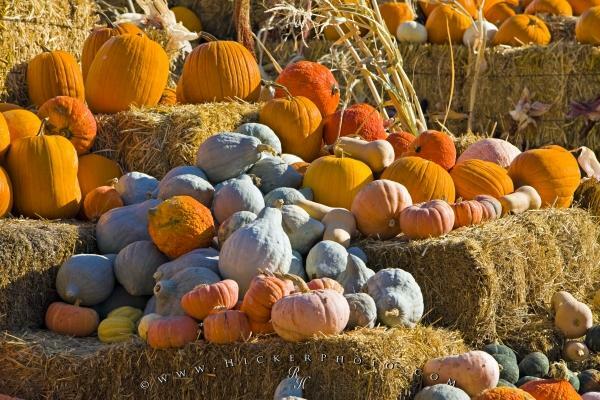 During the fall months in the town of Keremeos, British Columbia many of the produce stands make a colourful pumpkin pile outside their stalls. The Okanagan region of British Columbia is a fertile growing region for many fruits and vegetables and in particular the surrounding area near the town of Keremeos. Come fall, the growers display their pumpkin and squash crops outside their stalls, sometimes in one big pile. This large pumpkin pile was seen along Highway 3 in the town of Keremeos, the Crowsnest Highway in the Okanagan-Similkameen District of British Columbia. Pumpkins and squashes on display at a produce stall in Keremeos, Okanagan-Similkameen Region, Okanagan, British Columbia, Canada. Photo of a pumpkin pile on bales of hay in the town of Keremeos, British Columbia, Canada.